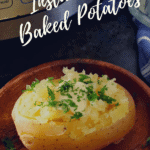 Home » How to Make Instant Pot Baked Potatoes! 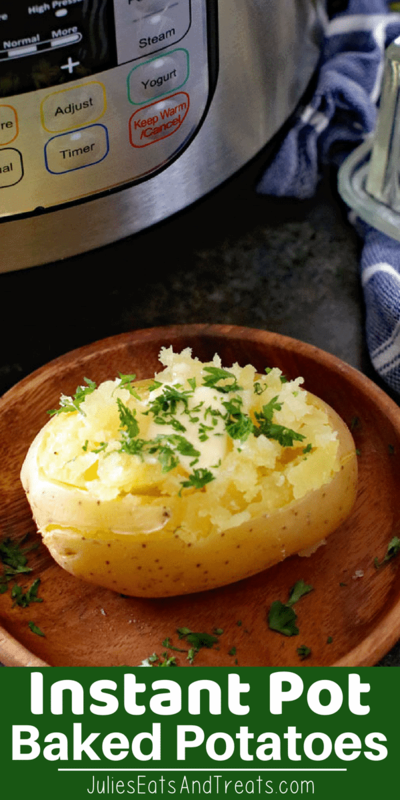 Light, fluffy baked potatoes made in your Instant Pot! 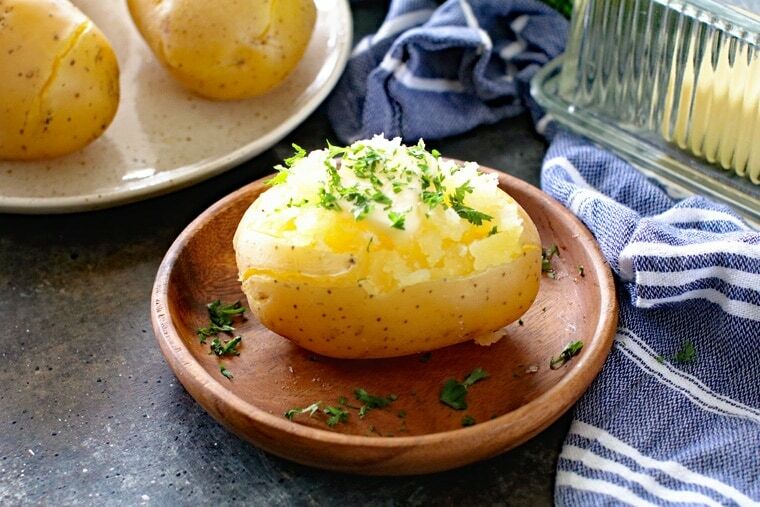 Grab your pressure cooker and make these fabulous Instant Pot Baked Potatoes. 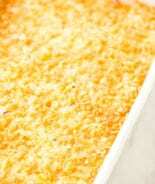 They perfect side dish for your pressure cooker! 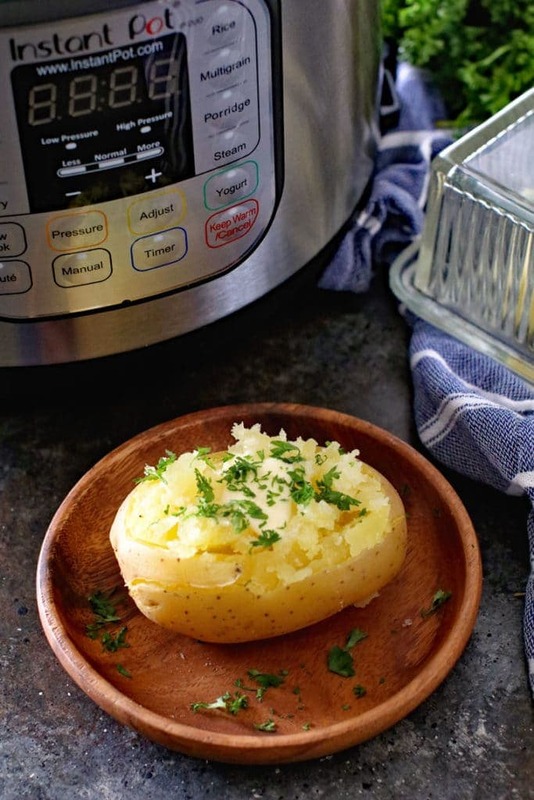 Did you realize you can cook potatoes in the pressure cooker? Mind blown, right? 🤯Light, fluffy baked potatoes in a fraction of the time. Ever since my daughter decided she loves baked potatoes I have been trying out different methods of cooking them. 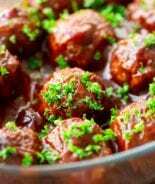 We’ve tried them in the Crock Pot and on the Grill so it’s about time we tried a pressure cooker recipe! Maybe I should try them in the actual oven sometime! Ok… maybe it’s not that epic, but to know I can pop potatoes into the instant pot and in less than a half hour have light, fluffy baked potatoes? Love that! Especially when there are kids hanging off of my legs during every single meal I make. Been there done that haven’t you? How long does it take to cook potatoes in a pressure cooker? Just 15 minutes under pressure and a 4 minute natural release. It’s such an easy method to bake potatoes! Baking a potato in the oven – prick well with a fork and bake in an oven at 350 degrees. Hasselback Potatoes – sliced thinly and stuffed with cheese and bacon then baked in the oven for 1 hour 15 minutes. Baking a potato in the microwave – 5 minutes on side one, flip and 3-5 minutes on side two. 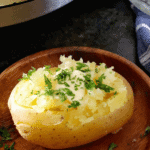 Crock Pot Baked Potatoes – on low for 7-8 hours. Cooking times will vary in each instance because of the size of the potatoes, how many you’re cooking etc. Any time that you’re cooking with potatoes you’ll want to scrub them well. 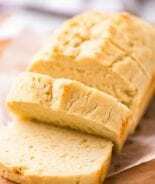 Wash them under warm water and use a vegetable brush to get in all the nooks and crannies! This is always worth mentioning, even if you’re peeling the potatoes to mash, be sure to scrub the outside of the potato first! Clean and scrub the potatoes. Prick with a fork several times. Place the trivet inside of Instant Pot pan. Pour water in the bottom of the pan. Place potatoes on trivet. Place lid on Instant Pot and seal. Press the “manual” button and set timer to 15 minutes. Make sure it is set to high pressure. 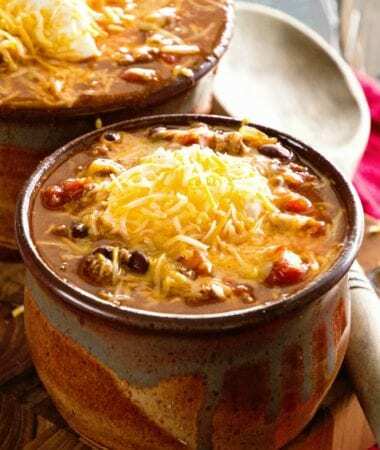 When the Instant Pot is done cooking, let it release naturally for 4 minutes. Then switch valve to venting position and let any remaining pressure release. Carefully open lid, gently remove the potatoes with tongs and place on a serving platter. Serve potatoes with your favorite toppings i.e. butter, shredded cheese, sour cream, chives, parsley etc. Enjoy! How many potatoes can you cook in a pressure cooker at once? I’ve cooked up to five potatoes in my pressure cooker, but the method remains the same even if you’re cooking less potatoes. 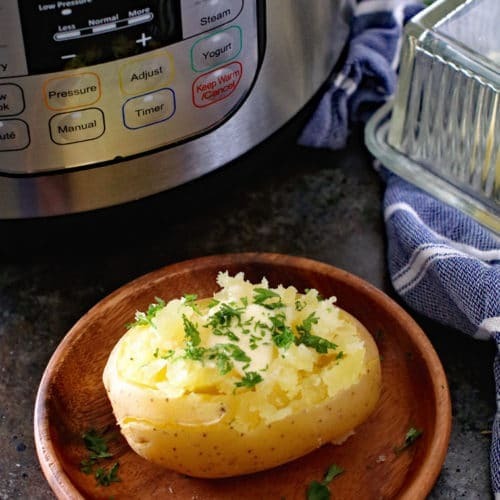 What’s the advantage to cooking potatoes in the Instant Pot or Pressure Cooker? The potatoes come out light and fluffy every time. You don’t have to heat up the entire house just to cook potatoes. 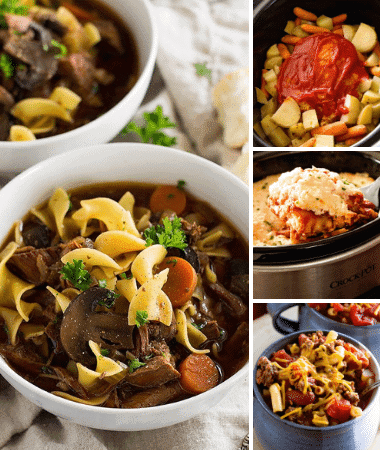 Although the other methods work great, the Instant Pot cooks quickly and efficiently. 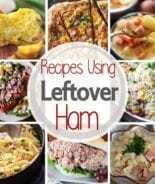 It’s more energy efficient that your oven, stovetop or a slow cooker. 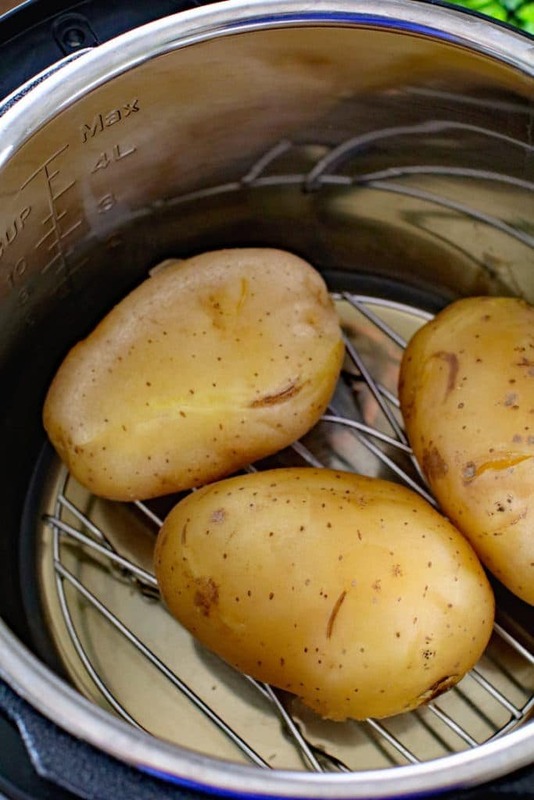 Whatever method you use to bake potatoes, there’s one important thing to remember. ALWAYS prick the skin of a baked potato prior to baking. Why? If you don’t it may explode! The steam builds up inside the skin of the potato and unless there is a way to allow it to escape, it will explode! No one wants to clean up that mess! That’s a mistake you only make once in life right? Wash and scrub the baked potatoes clean. Poke with fork several time all over the surface of the potatoes. Place trivet inside of Instant Pot Pan. Pour water in the bottom of the pan. Place potatoes on top of trivet. Place lid on instant pot and seal the valve. Press "manual" button and set timer to 15 minutes. Make sure it is set to high pressure. When the Instant Pot is done cooking it will beep a few time. Let it release naturally for 4 minutes., the switch valve to venting position and let any remaining pressure release. Carefully open lid away from your face. Gently remove the potatoes with tongs and place on platter. Serve potatoes with your favorite toppings i.e. 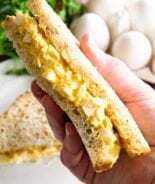 butter, shredded cheese, sour cream, chives, parsley etc. So easy! Definitely need to try this way! What a great way to get a good baked potato! 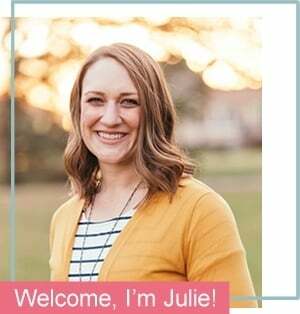 Can’t go wrong with fast and easy! My daughter is allergic to tons of stuff and often needs a baked potato for dinner. But then her mom (me) forgets to put one on the oven, and microwave potatoes are just not good. We got an Insta Pot a while back, and it has changed everything! Now I can have her potato ready in 30 minutes from start to finish, and it’s amazing! Exactly! My daughter loves them too! Can’t wait to try these out!! Great idea! !